Disclaimer: This review didn't get lost, the ice cream did (in the back of the freezer). 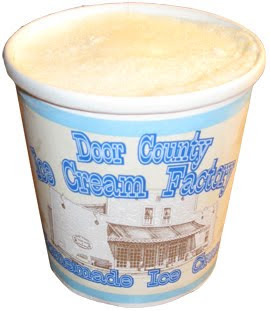 I apologize to Door County Ice Cream Factory and the Ice Cream of the Month club in advance. The freezer got a little disheveled and unfortunately my little homemade ice cream friend here got stuck way in the back. Sure, I could have reached back there and saved him on multiple occasions, but I just kept saying "I'll try it tomorrow". Well, in an effort to catch back up with my blogging, I grabbed this little guy, scraped off the freezer burned top and tried to dig in. Ugg, still freezer burned. I dug in further. Still freezer burned. I dug even further, but to no avail. Had this been a nasty flavor, I wouldn't really care ...but from the few bites I did take, I regret not cracking this open when it first arrived several weeks ago. I expected some bright green limey thing, instead I got something that looks like vanilla with just a faint whiff of lime. It's actually quite mellow. In fact, it reminds me of the lime jell-o mold my mom use to make. I've never been a big fan of lime, but I always had a few slices of that cold treat on my holiday dinner plate. Mmmmm, lim-e-licious takes me right back there.